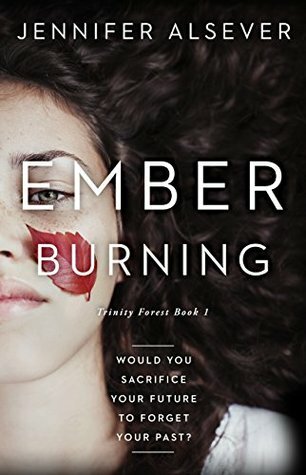 Ember Burning: Hello, Cliffhanger of DOOM! Senior year was supposed to be great—that’s what Ember’s friend Maddie promised at the beginning of the year. Instead, Ember Trouvé spends the year drifting in and out of life like a ghost, haunted by her parents’ recent, tragic death. At home, she pores over her secret obsession: pictures of missing kids— from newspaper articles, from grocery store flyers— that she’s glued inside a spiral notebook. Like her, the people are lost. Like her, she discovers, they had been looking for a way to numb their pain when they disappeared. Oshun Rising–Trinity Forest #2 is scheduled to release this August! So many huge thanks to Jennifer Alsever and Sawatch Publishing for sending a free egalley of this title my way in exchange for an honest review! This in no way altered my read of or opinions on this book. Okay, penguins, I need someone else to read this book RIGHT NOW so I have someone to commiserate with over that cliffhanger, because OH MY BEAK! It’s a good thing I don’t have to wait long for book two; you can bet your talons I’ll be picking it up ASAP, because I AM DESPERATE I NEED TO KNOW SOMEONE GIVE IT TO ME RIGHT NOW! Seriously, though–all shouting penguins aside, this book is gorgeous. Jennifer Alsever’s prose is flowery, descriptive, and so easy to visualize/fall into. The addition of synesthesia (in this instance, seeing sounds as colors) brought a fascinating and unique new layer to the main character. But honestly, this entire title is unique–from the plot to the setting, and everything in between. I felt, from page one, that this was bound to be unlike anything I’ve read before–and I was right. There is so much to adore about this book–the gorgeously rendered, easy to visualize prose is only the very tip of a steep iceberg! The prose isn’t the only “deep” thing about this read, though. These characters are well-rounded, complex, and beautifully balanced. By this, I mean there aren’t any “special snowflakes”…but there are also, so far as I can tell, no one entirely nonredeemable either. There is a gorgeous tight rope these characters walk down, and they wibble-wobble with the rest of us. It is clear, early on, that Jennifer Alsever watches people on a daily basis–she writes her characters so realistically, so believably, that it’s easy to imagine they truly exist as opposed to just being printed words on a page. These characters do, however, have their fair share of demons–and I feel I should note that there’s a bit of triggering material touched upon. If you are a sensitive reader or are easily triggered, please keep this in mind when picking up this book–and keep yourself safe! I am just SO glad I was given the chance to pick this book up, as I might not have discovered it on my own–and that would be SUCH a tragedy! This is a fast-paced read filled with muscle-clenching drama and unique, vibrant characters. The addition of synesthesia only helped to enhance the already gorgeous, flowery prose. I absolutely CANNOT wait to pick up book two this fall–that cliffhanger rocked my poor penguin brain, and I MUST know what happens next! I recommend this to lovers of uniquely crafted journeys, paranormal/fantasy settings, and realistically flawed characters. The cliffs are steep beyond the gate, penguins; watch your steps, and your souls. Dun dun dun daaaaaaaa…… Cliffhanger! Thanks for the review, Beth. I’m glad you enjoyed it, and I appreciate the kind words. Oshun Rising will be out for pre-order in just a couple weeks! Look for it on Amazon.com or sign up for a VIP reader on my site to get a heads up.